1. There are not enough volunteers (or paid staff) to cover every event. 2. Most of the volunteers are women, so when they serve they miss the event. 3. The budget limits the number of times you can offer childcare. 4. There aren’t enough trained workers (with background checks) to serve at all of your events. 5. When you offer childcare not enough women use it so the perception is it’s not needed. 6. You require registration, but kids show up that weren’t registered so you’re not staffed within the allowable teacher/child ratios your church has set forth. The fact is there are women (whether they are single moms, their husbands work late, or their husband has plans) that cannot come unless you provide childcare. 1. Enlist the help of Youth and College students. Youth groups are often willing to serve at events in exchange for a donation to help cover the costs of summer camp or a mission trip. Consider asking for tips for the servers instead of creating a line in the event budget. 2. Rotate volunteers (2 serve, each half the time so no one misses the whole event). Maybe you could allow those volunteers to attend the event for free in return. 3. Strongly encourage everyone in your Bible study to serve 1 week in the childcare program. 4. Require each small/discussion group serve together once a semester. 5. Work with your Children’s Ministry Director or church Childcare coordinator to train more people. 6. Increase the pay scale (charge for childcare, raise event prices, request more budget funds). 7. Seek out homeschooled teens and partner them with an adult. 8. Ask if your church (or nearby) preschool would be willing to share their sub list. Often those on the list would be willing to work as paid childcare workers. 9. 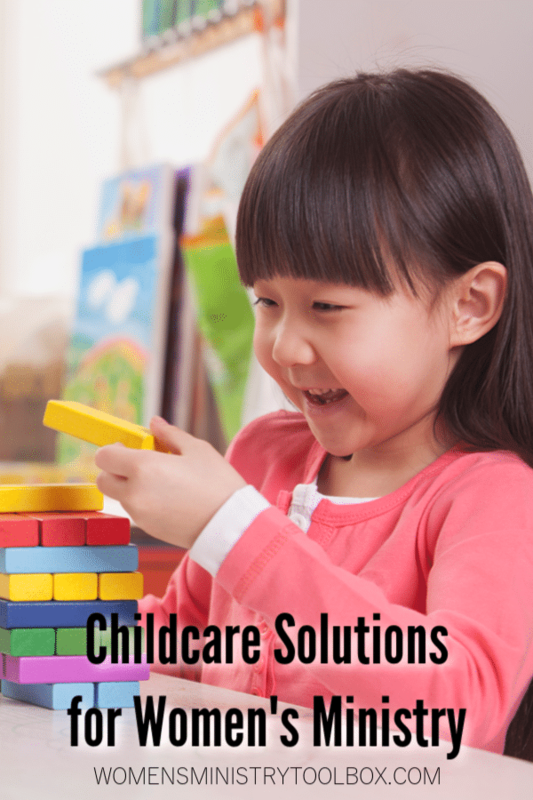 Is there a MOPS group or Mommy Group that offers childcare at your church or one nearby? Ask if they’d be willing to ask their workers if they would be interested in some more work. 10. Seek out older women who may be miles away from grandchildren that would love to rock some babies on a regular basis. 11. Ask the church staff if they have any recommendations. They may be aware of a woman that needs some holiday spending money. 12. If all else fails, speak with your Pastor. They may have an idea or solution you’ve not thought of. Don’t forget to make childcare a matter of prayer! Ask God to meet the specific needs you have. 1. Schedule your event with an earlier start and earlier end time so little ones won’t be up too late. When weighing a cranky toddler against a women’s ministry event sleep will win! 2. Try not to schedule your event during traditional dinner time. I would aim for a 6:30 PM start time. 3. Provide a healthy snack and let the moms know you are doing so – there may be allergy issues. 4. Moms, childcare workers, and even the kids don’t want to be “stuck” in a room for a long period of time. Try to keep events to 1 ½ or 2 hours. Provide opportunities for the children to get out of the room – playground, gym, baby buggies, etc. 5. Provide age-appropriate Biblical activities – don’t miss the opportunity to share about Jesus! Coordinating childcare is a big job! You may want to consider recruiting a woman specifically for that task. It may not always be possible or feasible to provide childcare for every women’s ministry event, however providing childcare provides moms the opportunity to attend when they may not be able to otherwise. Your turn to share: What tips do you have for other leaders that are struggling to provide childcare?